Young sleuths will love helping Gary Gumshoe find Madame Mahvelous’s missing ruby! This exciting spy activity book has 18 game pages of mysteries to solve. 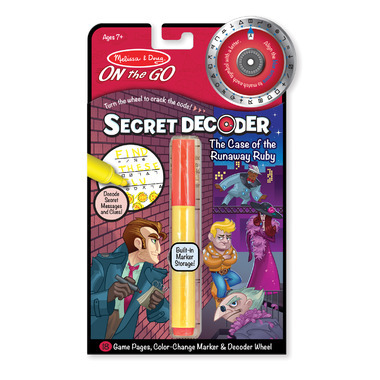 A few turns of the included decoder wheel, bound right into the book and visible from every page, will help detectives-in-training complete each challenge as they put their deductive skills to the test! To uncover even more case-cracking clues, master mazes, and complete puzzles, a magic-reveal pen is included, giving every page plenty of play value. It all stores neatly within the tab-close covers, perfect for spies on the go. 7 year old loved it and sat down and did the whole book in about 2 hours. Would have given it 5 stars but the decoder marker has a pretty strong odour that was off-putting. However, if the book is worked on slowly over over time, maybe the marker wouldn't be too bothersome. Perfect travel activity for my 6 year old boy! My 6 year old daughter loves these Melissa and Doug Spy books. I also bought her the spy set for a long trip and they kept her occupied for hours. My almost 7 year old loved this. When he was done with the book we cut the decoder off and he still uses it to write secret messages. I bought 8 more, to add to his treat bags at his birthday party.